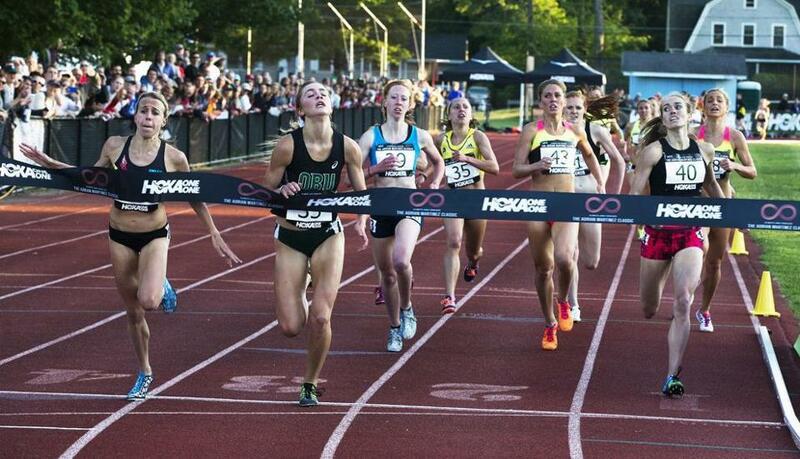 Nicole Tully (left) barely edges Hannah Fields (second from left) at the finish line in the woman’s mile at the Adrian Martinez Classic held at the Emerson Playground. CONCORD — Where else in the world can kids scoot down a playground slide and watch 18 sub-4-minute milers cruise by just a long jump away? Think that’s unique? How about watching a 71-year-old grandmother break a world record? 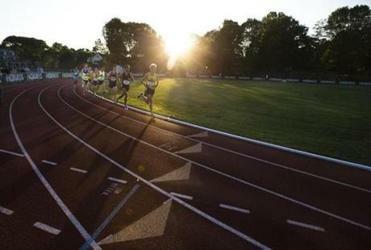 Welcome to the Adrian Martinez Classic, which was held Thursday evening at Emerson Playground. The event was born from sorrow. Adrian Martinez was captain of the Concord-Carlisle High School track team and a champion miler. By all accounts, he was kind, humble, and universally loved. He was carefree and didn’t believe in stress. After graduating from Williams College, Martinez was playing in a pickup soccer game in Acton when he collapsed and died of sudden cardiac arrest on Aug. 10, 2006. He was just 22 years old. The Classic, now in its seventh year, honors the former runner by raising funds for scholarships in his name. Sponsors fly in elite athletes for much-needed competition, and locals get up-close-and-personal access. There is no admission, no gigantic stadium, and a hometown atmosphere in which fans can high-five runners in the outer lanes. Organizers include races for local kids, plus high school teams, seniors, and even a family relay for everybody. 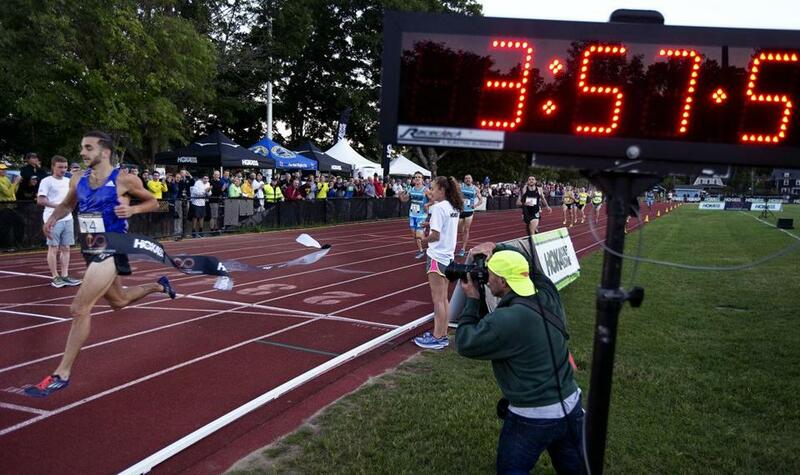 So on a perfect New England evening, hundreds turned out to soak up the competition, eat tacos, and meet the stars. The mile run is called the Adro Mile in Martinez’s honor. Martinez’s father, Angel, who championed the Reebok Human Rights Awards in Boston before moving to the West Coast, came here last year and felt as though his son was smiling down from the heavens. Robby Andrews won the men's mile with a time of 3:57.15. Chiang has a smile on his face at the elite runner registration table, where five Olympians signed in. Violah Lagat of Kenya, who finished fourth in the women’s 800 meters, spent time with several younger runners after her race. Abbey D'Agostino set a meet record in the women's 5,000. Abbey D’Agostino, a Topsfield native who won seven NCAA titles while at Dartmouth, won the 5,000 meters in an impressive 15:23.66, a meet record, and took home the women’s Best Performance Award. She says this event is special. Jan Holmquist of Burlington is 71, has three grandchildren, still works, and didn’t start running competitively until she was 50. 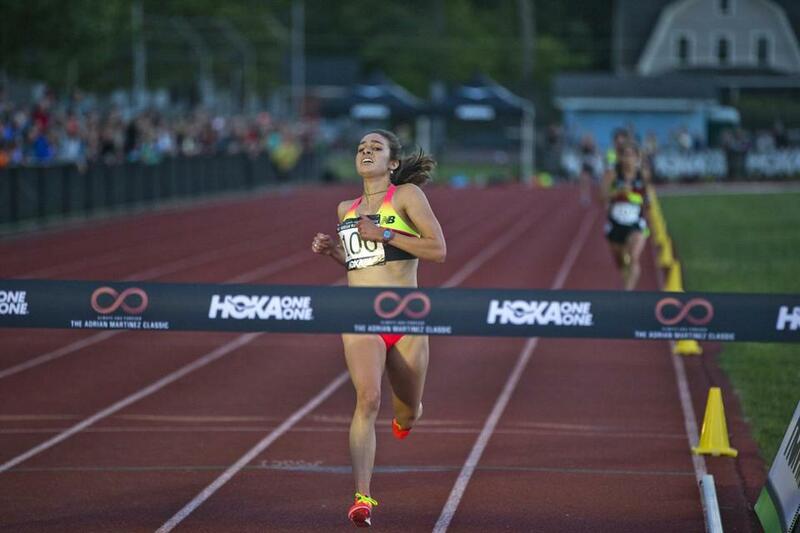 She ran a 6:37.21 in the mile to break the 70-plus world record, which had been 6:47.91. When she finished, she was barely breaking a sweat, and she jumped off the winner’s podium with a flourish. Endorphins, she says. But she also had a home-court advantage. Robby Andrews helped Team USA to a gold medal in the 4 x 800 at the recent World Relays Championships. On this night, he came out of nowhere to win the men’s mile in 3:57.15. He loves the closeness of the fans. “It is unusual here,” says the Freehold, N.J., native. “It’s a lot more intimate. You get the locals and the little kids, it’s really cool. The University of Virginia graduate says Martinez’s short life is a message for us all. Andrews received the men’s Best Performance Award. His father says there may have been some good karma at work. “My dad’s name is Adrian,” says Robert Andrews. “He was a runner for Manhattan College. I ran for Penn. And Robby’s middle name is Adrian. “This brings back memories of my dad,” he says, looking skyward. 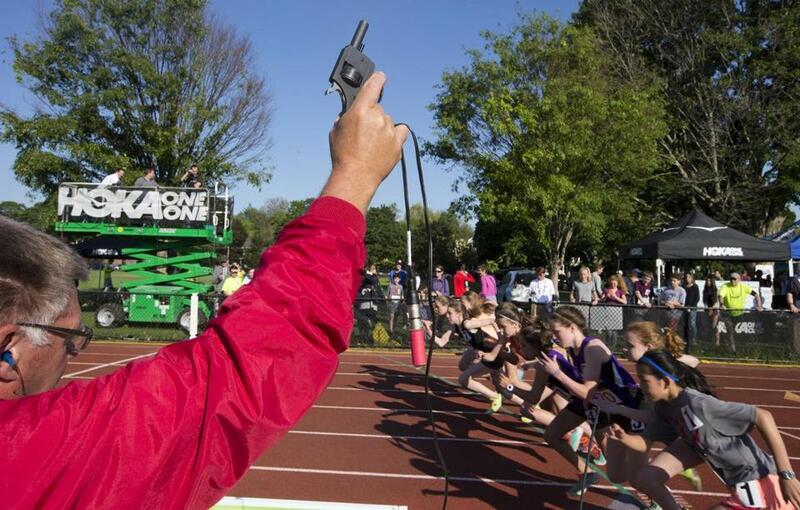 The starter's pistol is fired to begin a race at the Adrian Martinez Classic at the Emerson Playground.